OK, you know how much I love sushi. In fact, you’re probably sick of hearing about it. Too bad, because I’ve found a way to enjoy “my greatest vice” (as I so often refer to my sushi obsession) on the cheap. I got the idea a while back, after attending a special sake-tasting event at Chiso Kappo, where I paid $60 to sip a variety of fabulous sakes with the folks from Sake Nomi while rolling my own sushi rolls. 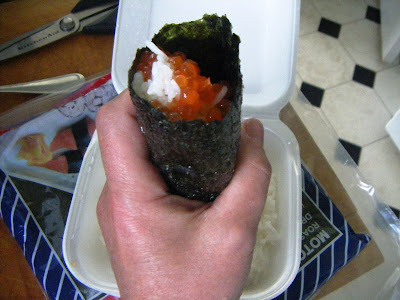 Soon after, I was tooling through Uwajimaya’s expansive seafood department in search of dinner when it dawned on me: if I bought some sashimi-grade fish and Waji’s pre-cooked sushi rice (I already had dried nori in the kitchen cupboard), Mac, Nate and I could have DIY sushi. Since we’ve long been making our own Vietnamese salad rolls for a quick, inexpensive dinner, I figured we could pull the sushi-thing off too. While it’s not exactly a “cheap” dinner, it’s certainly a whole lot cheaper than going out for sushi, or even buying the stuff already made at the supermarket. Did I mention it’s also fun? Of course, you want to buy your fish at a reputable seafood counter, and if you’re in a supermarket that makes sushi on-premise, as so many now do, you can get the pre-made rice from them. 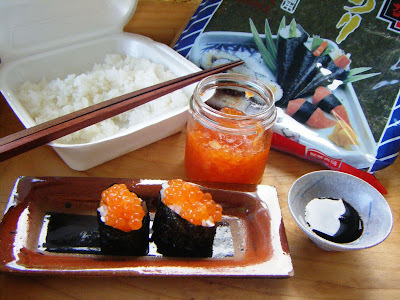 You can even go to your favorite sushi bar and have them sell you ready-made sushi rice. 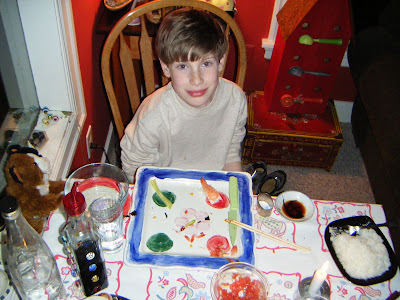 Though you could always make the sushi rice yourself (see recipe and video below, courtesy of sushimonsters.com). What’s more, if you’re don’t like raw fish, or feel uncomfortable about handling and eating raw seafood, you can buy cooked shrimp; or the (relatively) inexpensive blue crab they sell in cans at Trader Joe’s or Costco; or cook fresh shrimp or other seafood yourself; or make a vegetarian roll stuffed with whatever floats your boat (say, avocado, cucumber, roasted pepper, grilled mushrooms). The options are truly endless. So, anybody else out there make sushi at home? Have you got any tips — great places to buy fish? Practical tips for preparing sushi? I’d appreciate them, and I’m sure my Eaters would too.